One and Only Original Christmas Factory : Kathie Hill Music, LLC, Making music with and for kids for over 25 years! With arrangements by David T. Clydesdale, Kathie’s first release is truly a Kathie Hill CLASSIC! Lush orchestrations flesh out catchy songs & zippy dialogue from Mr. Hathaway and the students who visit the Christmas Factory to see how owner, Nanny O, makes her unique ornaments. As the Tree, Snowflake, Bell, Angel, Present and Star immerge from the Ornamachine (instructions provided) each comes to life to share their spiritual significance in song, ballet and comedy. In the end, eyes are opened, hearts are touched and Jesus’ birth is celebrated with a signature Clydesdale carol medley! Christmas Factory books are digital products and can be downloaded as soon as your payment has processed. All other companion products are physical and shipping charges apply. Performance DVD demonstrates "Ornamachine," costumes & blocking and limited choreography. Speaking Parts: 2 adult or child leads, 6 ornaments (kids or puppets) and many “kid lines” to divvy up! Kathie's Note: The first child is often your favorite and this might be true with “Christmas Factory”! Because it was produced 20 years ago, you can’t match it in orchestrations. With it’s clever staging and classic songs it’s both appropriate for public schools and churches with an invitation to respond to God’s love in Jesus Christ. Digital download of Split Trax CD with left channel instrumentation and right channel choral vocals for One and Only Original Christmas Factory (does not contain dialogue or solos). Contains CD facepllate PDF. Downloadable book of all songs, script, production notes and piano transcriptions for One and Only Original Christmas Factory with permission to make 3 copies. Additional copies require purchase of additional 3x license/s. Jewel cased CD with full cover art and complete musical contains the entire musical One and Only Original Christmas Factory with dialogue and songs. A MP3 audio download of stereo recording of 11 songs w/license to make 3 copies - Additional copies require purchase of additional 3x license/s. 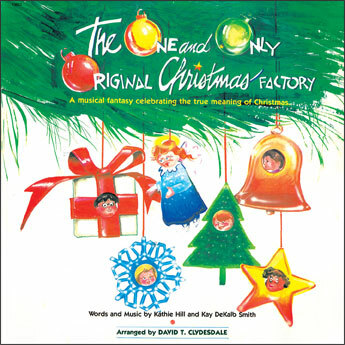 Set of 10 paper sleeved CDs of complete One and Only Original Christmas Factory musical with all song and dialogue. Full One and Only Original Christmas Factory performance of musical by a children's choir. Downloadable One and Only Original Christmas Factory book with script, all songs in leadline only and activities with permission to make 3 copies. Additional copies require purchase of additional 3x license/s.